We’re Lighting Up Central Florida! Go Back to the Homepage / We’re Lighting Up Central Florida! Have you been looking around your landscape and wondering what it needs to really bring it together? We’ll give you a hint: it rhymes with bright. Nine out of ten of our clients say they love their landscape but hate coming home to a dark house. Or in the commercial industry, not doing their maintained building justice. We’re here to tell you that there is a solution and a pretty quick one at that. 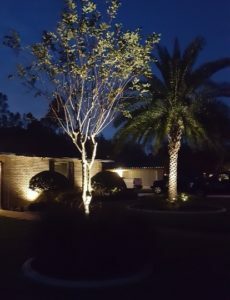 Landscape lighting is what you’ve been looking for. If you’re new to the low-voltage landscape lighting world, click here to get a basic knowledge. At Total Sprinkler and Lighting we allow our work to speak for itself. We love what we do. Really. Last year we installed six brand new systems, revamped three from top to bottom, and repaired countless more. This year we’re looking to double that (or triple or quadruple!). 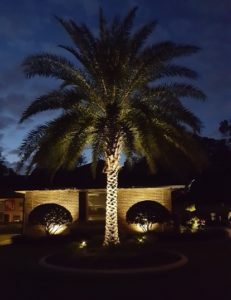 We want you to know that when it comes to landscape lighting, we’re setting a new standard in the industry to install products of the highest quality, at the best price, and with customer service that we want to be known for. When our client asked if there was anything we could do, we offered our expertise in a solution that worked both with his budget and his vision. Take a look at his home and landscaping now. If you’re thinking you need lighting, use this link to contact us. We’re always available to make your dream a reality.